In 1932, sisters NAGOYA and JOHORE MARUs were completed for Ishihara Sangyo Kaisha, K. K. (ISK) of Fuchu. In 1941, NAGOYA MARU was requisitioned by the IJN and converted to a submarine depot ship while JOHORE MARU was requisitioned by the IJA and converted to an Army troop transport. NAGOYA MARU was reconverted to an aircraft transport in 1942 and used in this role until she was torpedoed and sunk in Jan '44. 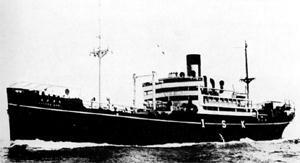 JOHORE MARU was sunk by an American submarine in Oct '43. Armament: Six single mount 152-mm/45 41st Year Type guns, two dual 13.2-mm Type 93 machine guns.